In Hollywood, Perry Como hosts the second annual awards. Perry's aide is swimmer Debbie Meyer, winner of four Olympic Gold Medals. Winners in eight categories are chosen by their fellow athletes; sportswriters choose the Pro Athlete of the Year. Nominees and celebrity presenters...Baseball, AL: Ken Harrelson, Red Sox; Frank Howard, Senators; Denny McLain, Tigers. NL: Bob Gibson,Cardinals; Wille McCovey, Giants; Pete Rose, Reds. Presenters: Danny Kaye, Roy Campanella, Joe Cronin. Basketball: Elgin Baylor,Lakers; Bill Russell, Celtics; Wes Unseld, Bullets. Presenters: Bill Cosby, Red Auerbach. Football: AFL: Lance Alworth, John Hadl, Chargers; Joe Namath, Jets; Paul Robinson, Bengals. NFL: Deacon Jones, Rams; Leroy Kelly, Browns; Earl Morrall, Colts. 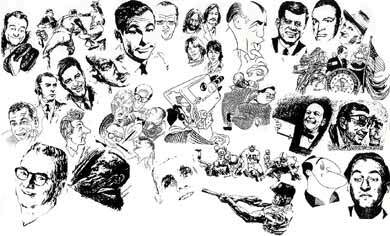 Presenters: Charlton Heston, Vince Lombardi, Sammy Baugh. Golf: Billy Casper, Jack Nicklaus, Lee Trevino. Presenters: Jack Benny, Sam Snead. Hockey: Jean Beliveau, Canadiens; Gordie Howe, Red Wings; Bobby Hull, Black Hawks. Presenters: Art Linkletter, NHL President Clarence Campbell. Horse Racing: Braulio Baeza, Angel Cordero, Lafitt Pincay. Presenters: Kim Novak, Willie Shomaker. Pro Athlete of the Year nominees: Denny McLain, Earl Morrall, Joe Namath. Sportscaster Vin Scully narrates films of the stars in action. The soul-rock music of the Jackson 5 is the main attraction in this prime time ABC special. Included: a lyrically bouncy basketball game pitting the Jackson 5 against basketball greats Elgin Baylor, Elvin Hayes, Bill Russell, pro-football players Ben Davidson and Rosey Grier.